This is Hurley's page. There couldn't be a better tortoise. He is a Homes Hinge-Back Tortoise. I got him for my 12th B-Day. He is now 14 years old. Our best time was today when he got his first look in the mirror. He sat there for 20 Minutes. I don't know how he felt about it. That is our best story and a description of him. Thanks!!! Comments for Hurley the Great!!! What a wonderful Tortoise, he looks so healthy and Happy..Good for you! Fourteen Years and he's going stronger then ever. He may of been looking in the mirror so long because he thought he found a new friend to play with...I think he's finally old enough for a girl-friend don't you? You are a GOR-geous tortoise! I'm glad you got to see yourself in the mirror. 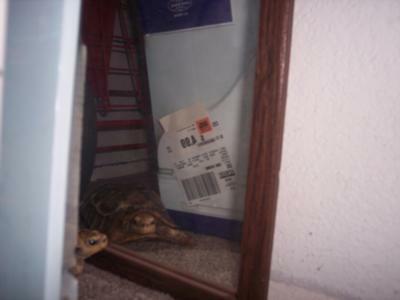 I like to look in the mirror as often as I can 'cause I'm a BeUtiful tortoise! PS. Jacob is probably jealous of you at least a little. That's probably why it took him so long to let you have a look at yourself. Be sure to let him know that you think he's also a good-looking guy so he will share his mirror with you some more.